When organizing a big event where plenty of people are invited, security has to be of paramount importance. The same goes for large multinational companies. For such events and companies, the services of armed guards are often considered to be the right form of security that can be provided. Guards provide the most effective defense in the face of emergencies as they are the ones on the ground level. The license to carry firearms is the reason why they are more effective than other surveillance methods like CCTV cameras and alarm systems. We, at Willo Security, understand the impact that the possession of a lethal weapon can have on a miscreant. We offer security services in the areas of Akron, Canton, Cincinnati, Cleveland, Columbus, and Ohio, ranging from patrol guards to guards with weapons. 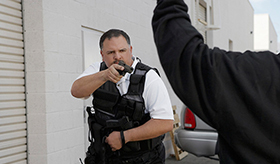 Below, we have given a few reasons why it is important to hire the services of an armed guard. Take a look. Security personnel are always positioned as close to ground zero as possible. This enables them to be the quickest to respond to a crisis. A surveillance camera will have to be monitored and always has a chance of malfunctioning. Hiring an armed guard effectively eliminated any glitches arising from technology. Guards are given extensive training not only on protection in general but also on the proper use of the weapons. Having an able-bodied person standing guard next to you is, often, all the comfort and peace of mind that you can possibly want. A guard who is carrying a firearm is not only vigilant but also brave enough to protect you in any odd situation. Any anti-social element will think twice before causing a nuisance with such a security personnel around. So, if you want to hire an armed guard for the safety of your employees or the guests you have invited to an event, give us a call at our toll-free number 800-875-2939 immediately.